What do you do with a degree in Genetics? This series of posts is about people who have studied genetics, about why they study genetics, and what they plan to do in the future. Our first guest is Kathryn McRae, who is studying for her Masters degree in Genetics at the University of Otago and AgResearch Invermay. 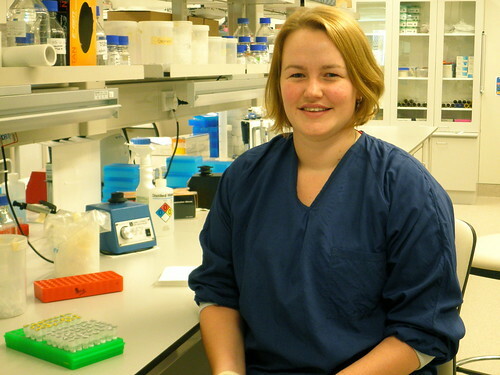 Her supervisors are John McEwan (AgResearch) and Neil Gemmell (Centre for Reproduction and Genomics, University of Otago). Briefly, what is your research area? Animal genomics, or more specifically sheep genomics. My project looks for signatures of selection sweeps in parasite resistant and susceptible flocks, so it also involves statistics, and a touch of parasitology and immunology as well (so a lot of learning on the job). I have the greatest respect for teachers, and how much they can change the lives of their students; I can thank two teachers in high school for my current career path – one for introducing me to genetics, and the other for nurturing and expanding that interest. From the first lesson on genetics I was hooked; I went home that night and made all my family try to roll their tongues so I could draw up punett squares and make a pedigree! What is the best part about your study? When everything works! That and knowing that my research has the potential to make a difference for sheep farmers. There’s a certain satisfaction in being able to justify what you’re doing every day. Conversely, are there any downsides to your study? When nothing goes right, and you can’t figure out why. It’s also hard sometimes seeing friends who are out in the workforce and earning great money, but when it comes down to it I’d much rather be doing my job than theirs. What keeps you going when your work gets stressful? I find it often helps to talk to other scientists/post grads, as they can usually empathise. Exercise helps as well; breaking up my day with a trip to the gym is a great way of clearing my head. And sometimes I just need a break, so I’ll get away from Dunedin and head down home for a weekend and get some fresh air. Tell us a little about your education and career path. Do you think your career path is typical for your field? My undergrad education was probably pretty typical; I spent 3 years at Otago studying Genetics and Zoology, and then did a semester on exchange at the University of Glasgow in Scotland. When I got back from overseas my intention was to find a job, but I went in to a meeting with my now supervisor to talk about job opportunities, and came out with Masters project! I’m based out at the Centre for Reproduction and Genomics (http://www.crg.org.nz/) at AgResearch Invermay instead of in at the university, which is a first for a Genetics student at Otago. I remember as an undergrad being advised to think carefully about doing postgrad study through a company, but none of the dire predictions have come true. The facilities (and the people) out here are fantastic, and while I do have to get clearance for any publications, I’ve never had any issues. I definitely think it’s an option more people should be considering. Are there any courses, internships and experiences that you found valuable? Any defining moments? Things you would do differently? People who influenced you? After that first introduction, my decision to study genetics was confirmed at a two-week science camp in Auckland when I was 17 (what a geek). At Otago itself, one of the best choices I made was to do a summer studentship after my 3rd year, which is something I wish I had applied for earlier on. Until that point I had little interest in research as a career, but the experience gained from a summer in the lab was invaluable. If I had one piece of advice for undergrads doing science, it would be to apply for the summer studentships! Dunedin in the summer is actually a pretty nice place… honestly. As for influences, my family has always encouraged me to continue on in science, despite the occasional ribbing from my brothers about my never-ending time at university. I’ve also been lucky in that I have two great supervisors, and a good support group of both science and non-science friends, the latter of whom are kind enough to nod along when I ramble on about my project. Have you ever considered leaving science for a different career? Why? What made you stay with science? When I came back from overseas, the ’global financial crisis’ had just hit, and finding a decent job in genetics with only a BSc seemed a near impossibility. At that stage I seriously considered going to teacher’s college, but before I made too many plans I was offered my current masters project and had committed myself to a further two years of study. While here have been times when I have questioned my sanity, at the end of the day I love the variability of science, and the joy of discovery. There’s nothing quite like it. Do you have any role-models? Dr Pardis Sabeti, who I’d hadn’t actually heard of until last year when I started working on the more statistics-based aspects of my project. She’s had an amazing career so far, and manages to combine maths and biology and still be cool (and she’s in a rock band). Who wouldn’t admire that??? What’s the next step for you career-wise? By then I will have finished my PhD, and plan to still be in science, either back here in NZ or maybe even Australia. I’d love to be still working in agriculture; there’s so much that can be gained by utilising genomics, and I’d like to help make that happen.